Traditionally known as one of the “Three Sacred Treasures” (the other two being the “sumi-tsubo” and “sashi-gane”) for the Japanese woodwork builders, the Chouna is a unique tool used since ancient times. Also known as the “living fossil tool”, the Chouna has been found in various archeological sites in Japan. Although rarely used in modern times, the Chouna still remain in the hands of many of the builders as a tool passed on through the generations. The tool is a type of ax used to create a flat surface on a round wood in order to make posts, beams, and other wooden structures. The handle of the ax is made of wood and rounded at the end. The builders would stand with the wood in between their legs, hold the Chouna in front of them with edge of the blade facing towards them, and would drop the ax and pull the blade towards their bodies similar to using a hoe. The scooping motion would then shave off the top portion of the wood below creating a flat surface. One of the distinguishing marks of using a Chouna is the fish scale like pattern the ax makes on the wood. In other regions, builders may smooth out this pattern using other tools, but in the Hida region, builders left the pattern as it was part of the design. 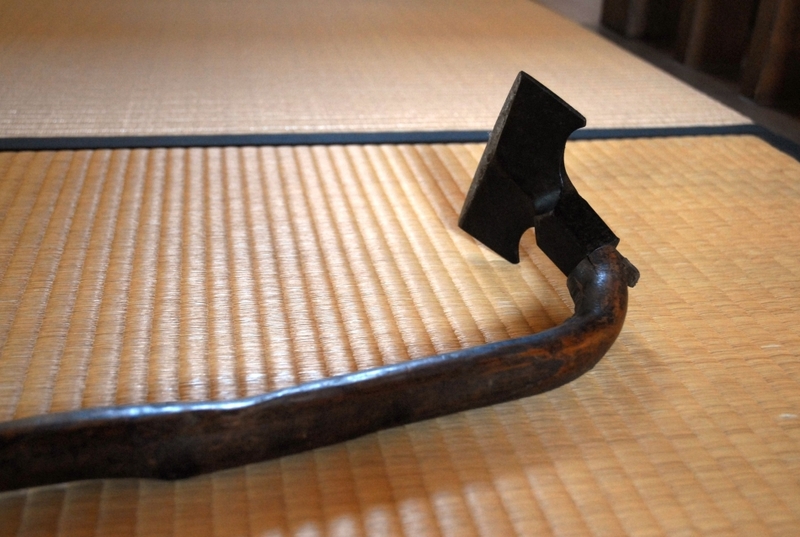 Chouna is also considered as one of the most dangerous tools for the traditional Japanese builder. Because the blade is coming towards the person with great force, if the builder is not careful, he can easily injure himself. Therefore, to prevent injury, the Chouna was often custom made to fit the person. The builders would go into the woods to select the branch or piece of the wood with just the right curvature for them. In the Hida region, softer wood, such as the Silverberry or Oleaster tree were used as they act as shock absorbers and dissipate the force coming through the ax as it hit the lumber.